I've got my final paintings for Tree's Place in rotation. The large B-25 has a lot of sky in it, which means a vast gradation of blues. It's in the drying stage prior to adding in the plane. Another painting is drawn out and ready to begin, and while all that was going on I did this loaf of bread. Karen is a real fan of my bread paintings, and she insisted that I had to have a full loaf, wrapped in plastic, for this show. I wasn't sure I wanted to go in that direction, but she was persistent, and now that it's complete I'm glad I did. I painted a composition similar to this for a corporate commission a couple of years ago, and really wanted to visit it again. I've got over a hundred photos of these items in various configurations, and it seemed a waste to only use one, so here's another. 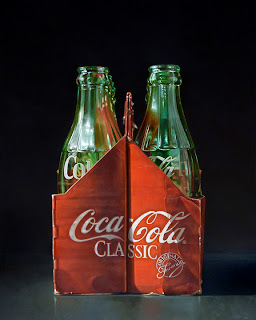 This will be joining Coke Classic at the Tree's Place show in July. 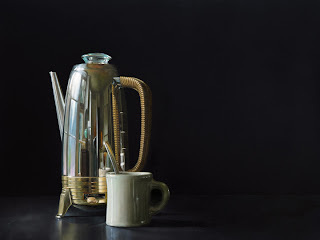 I talked with Julie at Tree's Place a little while back, and she said that they will be doing an article and full-page ad in the July issue of American Art Collector magazine. Very generous of them, and very cool. 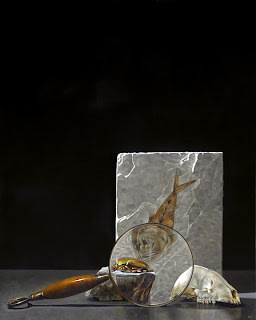 Karen and I shared an article in AAC back in 2007 when we had a joint show at Wynne/Falconer Gallery, also on Cape Cod. I have to admit, I'm very excited about this! The canvas is prepped and ready to go for the one large piece I'll be sending to the show. An alternate version of the B-25 I did for Mason Murer Fine Art. It's an interesting crop, and I'm looking forward to getting started on it. If it works out time wise, I'll put up an in progress shot. I had intended to post an in progress image of this painting, but Blogger went down for a couple of days right around the time I reached the end of the first pass, so I went ahead and and waited until it was done to post. This piece, as with practically everything else I've painted this year, will be shipped up to Cape Cod for a solo show at Tree's Place Gallery opening July 9th. This is the first time I've dedicated this much time to a single gallery for a show, and I have to admit it has been an endeavor filled with more than an little anxiety, but it felt like this was the right time, and this was the right gallery to give it a try. Keeping my fingers crossed that it goes well. My next painting is currently at the halfway point, and I should have an image of it ready to post in the next couple of days. I've got three more paintings to do once its done, and four weeks to do them in. One of them needs to be a large "centerpiece". I predict it's going to be a busy month. I've been working for the last week and a half on these two horizontal's for the Tree's Place show. I had already started another painting on this particular canvas, but hated it, so I sanded it off, and reworked it into a pb&j. I'm partial to these off center compositions, and use them frequently. Maybe over frequently it, I don't know. With this 10 x 30 I was able to push the subject significantly off to the left, and I like it a lot. I think it gives the subject a greater sense of its position in space. 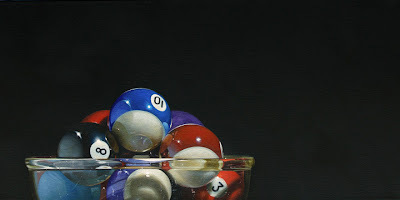 What would a collection of my paintings be without at least one painting of some pool balls? The size of the balls in the composition are a little over scale, but not so much as to make them freakishly large. They're just big enough to incorporate some serious detail into their surface. One of my favorite parts of these paintings that utilize a mixing bowl, is that thick rim at the top of the bowl. I love the distortion it creates of the contents, and how it imparts that glassy sense of glass. 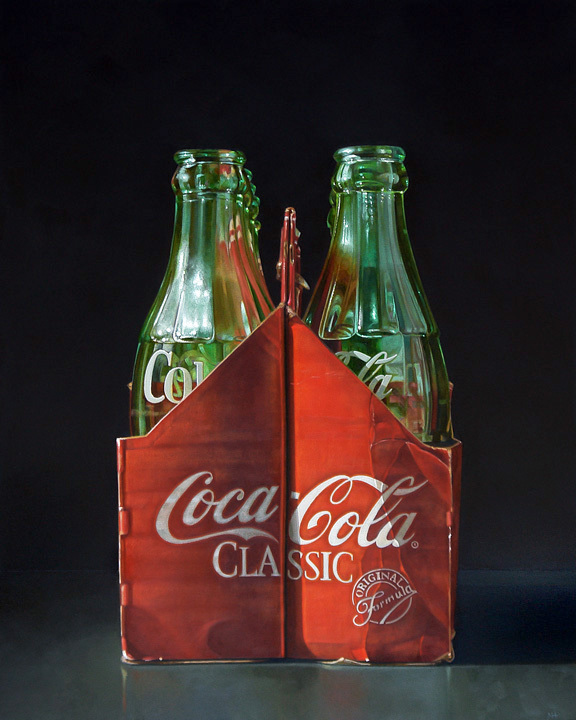 I've got another Coke painting going now. It's large enough that I may post some in progress images of it. It's getting close to the deadline, and I've still got a number of paintings to go if I'm to meet my quota. Hope I can do it. Every once in a while I work on a painting that is just snakebit. The process goes wrong from the very beginning. 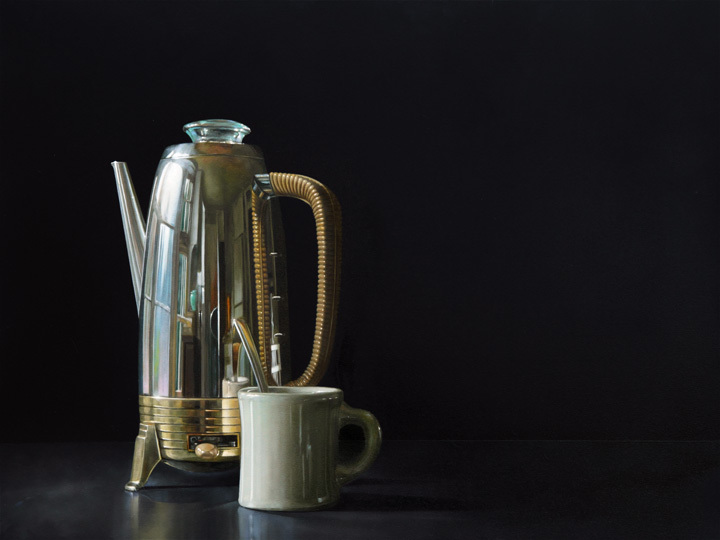 This has proved to be one of those paintings. Most often, by it's completion, the painting has been salvaged, but there are occasions when the canvas will get the rag. I won't go into the full litany of problems I've encountered with this piece, but suffice it to say it's been fighting me every inch of the way. Part of the problem was the surface and the panels' construction, another, to be honest, was me, and most recently an incorrect use of a medium. I never use a medium, but thought with this painting it was a good idea. I'm currently waiting to see if I made the right decision. I went ahead and posted the image today because even though there are still problems to be solved, I think it's a good painting, and believe it can be saved.